The walk will cover the early beginnings of Ocean View/West Berkeley from its natural history, Strawberry Creek, and the formation of the Bay 10,000 years ago to the coming of native people 5,700 years ago, their habitation here for 45 centuries, and the shellmound. The walk will encompass the rise and fall and rise again of West Berkeley as it grew through WWII, fell into disrepute after the war with the loss of industry and red-lining, and its revitalization in the past 30 years thanks to a growing understanding about its important place in the history of Berkeley. Most of the walk will be about the coming of Euro-Americans, the early industries (including Spenger’s Fish Market), alterations of the natural landscape, the necessity for worker housing, and the growth of the neighborhood through the decades. While exploring a residential area and the Hopkins Street commercial area, we will learn about the early Peralta Park development and how the streetcar lines shaped the district that is still thriving today as a foodie haven. We will also see the first edible schoolyard, the North Branch Library, Victorian and Craftsman architecture, a mural, and an amazing sculpture collection. The walk is a little under 2 miles and is fairly flat. In 1960, the College of California (predecessor to Cal) moved from Oakland to its present site in Berkeley in part because of Strawberry Creek. Its notable start was not always honored during the next century when pollution, concrete channeling, underground piping, and elimination of the middle fork occurred. Much of that has changed since the mid-1980s. Learn about Strawberry Creek’s history, its hideaways, and the restoration efforts from Bob Charbonneau, the expert who made Strawberry Creek and its restoration his master’s thesis. Start your tour of Downtown Berkeley in our new BART Plaza and hear about the development of the new plaza, as well as other development projects in the Downtown, including the new hotel and parking garage. Then explore the Arts District including new BAMPFA, Berkeley Rep, and other arts venues; and then other new and historic buildings in the Downtown. Also, hear about old and new shops and restaurants that serve the Downtown community. Join the Friends of the Fountain for a walking tour of the Northbrae neighborhood that is home to Berkeley’s beloved Fountain at The Circle and adjacent Fountain Walk. Learn about the history of the fountain and its whimsical grizzly bear cubs, Berkeley’s first public work of art in 1911, about these landmarks’ role in an ill-fated plan to crown Berkeley the capital of California, and about the neighbor-led effort to restore the fountain and walk in the 1990s. The walk will also take note of other neighborhood landmarks, both natural and architectural. A downloadable/printable flyer is HERE. Tours start at 10 am and end by approximately 12 noon. Sometimes they are slightly longer, so some extra time should be allowed in case the walk meets an informative passerby or dwells at an interesting site. Tours are limited to 30 paying participants unless noted otherwise. Pre-paid reservations are required and tickets are not refundable. Tours are conducted in rain, shine or Berkeley fog and are wheelchair accessible unless otherwise noted. Keep a record of your order. E-mail addresses and telephone numbers are very important for last-minute changes and confirmations. You will be sent an e-mail or we will mail confirmations with starting points. 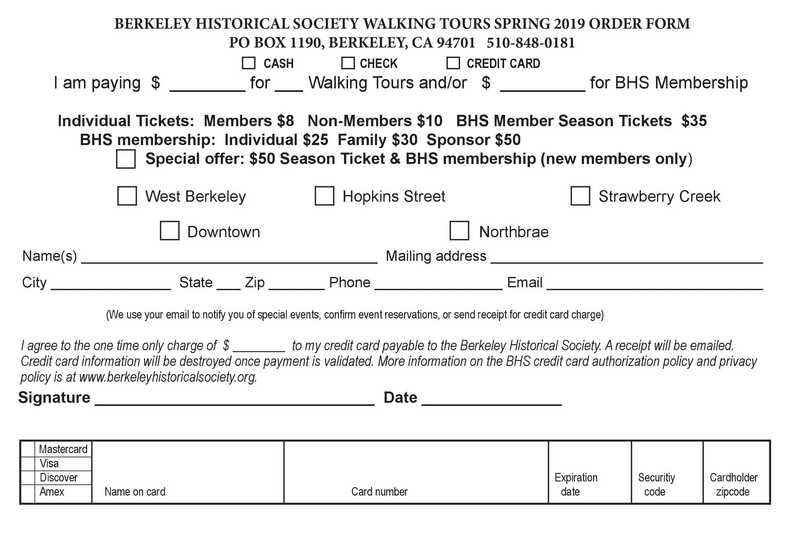 If you have suggestions for future walking tours, please contact the tour organizers at BHSwalks@berkeleyhistoricalsociety.org or leave a message on the BHS phone answering machine. For last-minute reservations, call 848-0181 between 1 and 4 pm on the Thursday or Friday before the tour to determine meeting place and sign up if there is an opening. The BHS, a volunteer organization, appreciates your support. Information about past walks is in the Web Archive.